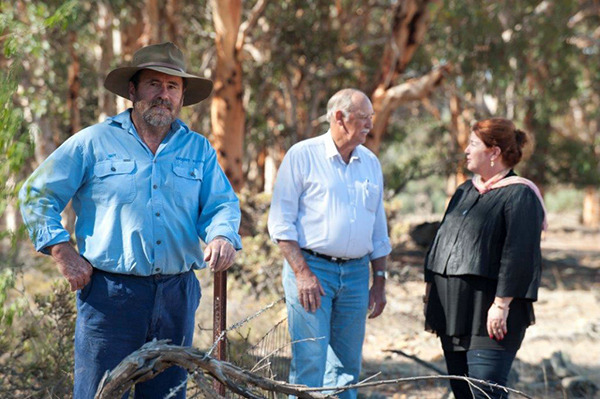 The latest round of funding to help landholders look after their native bush land has been launched on a property near the Wheatbelt town of York. The Bushcare Grants program has injected more than half a million dollars into the region in the past four years, funded by the Australian government. Managed by natural resource management group Wheatbelt NRM, the scheme works with landholders to protect existing remnant vegetation and carry out weed and feral animal control. The official launch took place on the property of Guy Bowen, who was successful in applying for a Bushcare grant. He’s received funding to fence four and a half kilometres of bushland between his farm and a nearby reserve. “We farm adjacent to St Ronan’s Nature Reserve where the fence lines are falling down and in desperate need of replacement,” Guy Bowen said. “With the help of this grant we can replace the fences which help stop the sheep getting into the reserve. “It’s a beautiful block of bush where we’ve got all sorts of wildlife and it’s wonderful to be able to have linkages through to the reserve. The Federal Member for Durack Melissa Price officially launched the latest round of Bushcare grants. “All this work is voluntary by farmers who want to carry out work in their backyard,” Melissa Price said. Applications close Wednesday, 13th May 2015.